I have always been a target for bugs. I can be with a group of people at an outdoor event and be the only one who goes home with mosquito bites. Whereas flies might just land on others around me; they bite me. Even though bugs love me, I have always been leery of commercial bug repellents, and, as a mother, I have not wanted to use them on my children. Many commercial insect repellents contain DEET (N,N-diethyl-m-toluamide), an insecticide the US Army patented in 1946 that can affect the nervous system. The Environmental Protection Agency warns against breathing DEET in and advises that you should wash it off your skin when you return indoors. Since we all enjoy spending as much time outside as possible during the summer and don’t want to have our fun spoiled by itchy, painful bites, I have explored natural ways to repel bugs. I have discovered that it is surprisingly easy and inexpensive to make your own bug spray using essential oils and other natural ingredients. Essential oils are highly concentrated, so you may need to experiment to get the right mixture that works for you, especially if you have sensitive skin. You also can mix and match the oils you choose. Some great combinations are lemongrass with citronella and basil, or lavender with geranium. Now you need to choose your carrier. Water-based: Essential oils don’t mix well with water, so you will need to add another liquid as an emulsifier. Pour two to four ounces of witch hazel into an eight-ounce spray bottle. Fill the rest of the bottle with pure water and then add about 40 drops of an essential oil. Stir well. Vinegar-based: Combine 25 drops of essential oil with one-fourth cup of organic apple cider vinegar in a lidded glass jar. Shake to blend. Dab some of the liquid on your skin (such as on your wrists, behind your knees and around your ankles) or clothing. Combine two tablespoons of witch hazel with two tablespoons of one or a combination of the following: olive oil, almond oil or grape seed oil and 40 to 50 drops of essential oil. Some people recommend adding a half teaspoon of vodka as a preservative, but I have not tried that. When applying your homemade bug spray, take care to avoid the eye area. As with all essential oils, it is wise to consult your doctor before applying on babies and very young children or if you are pregnant or nursing a baby. You will need to re-apply the product after about an hour or after exercise or swimming. Store any unused repellent in a dark bottle, away from heat or sunlight. Add all ingredients to a two-ounce tinted spray bottle. Shake well before each use. Mix one-half cup of witch hazel, one-half cup of apple cider vinegar and 30 to 50 drops of eucalyptus oil in a bottle and then shake the mixture well. Apply mixture on uncovered portions of your skin, carefully avoiding your eyes or mouth. 1. In addition to eucalyptus oil, flies dislike the following essential oils: lavender, citronella oil, pennyroyal oil, lemongrass and peppermint. 2. If flies tend to get inside your home in warm weather, try keeping 10 to 15 cloves on your dining table to ward them off. 3. Flies do not like the smell of elder, basil, lavender and mint. Plant these herbs in your garden or as potted plants in your home. Dab a drop of vanilla extract on your skin or mix vanilla extract with witch hazel and water for a bug spray. Do you have lavender in your garden? 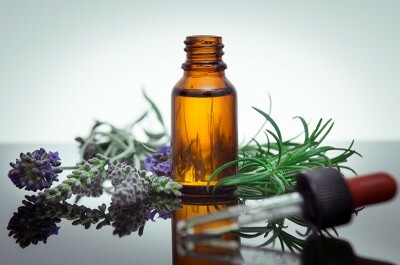 Rub lavender flowers on your skin, especially on your neck, under your arms or behind your ears to repel insects. You can also try rubbing basil leaves directly on your skin for a quick repellent. As you do with many decisions you make for your family, insect repellents require weighing your options. If you are camping in the woods, for example, the risk of getting Lyme disease may outweigh the risk of using a commercial bug spray. For everyday use, however, your family will be able to keep bugs at bay without the scary side effects of the chemicals in store-bought sprays by using natural ingredients. Bugs beware! Previous PostAre you Ready to Shelter in Place during Ebola Outbreak?